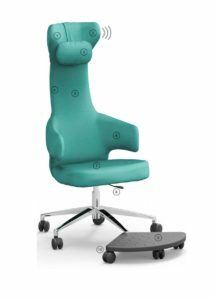 Created from these field observations during one year, Siddy has shorter armrests with a downward tilt, allowing to approach closer to the desk and adopt a 90 degree position of the armrest. The back is narrow, it bears only the spine, leaving both sides of the back free. Rounded, it extends to the level of the lumbar, A retractable footrest has been integrated to Siddy. 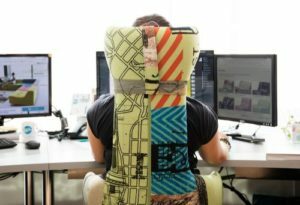 It is designed to be attached to the chair. The footrest tray can be swiveled to the left or right, allowing the two feet to rest together or alternately. This favors the change of position without affecting the verticality of the column and avoids incorrect postures. This chair can be used by extremely thin people as well as by tall people. Siddy compensates for ambient noise in “open space” or disputes over the choice of radio or music in background music listened to during the day (what pleases one, disturbs others): French company New’ee allowed the technological development to solve this problem.The Siddy chair offers the possibility to include a new speaker system transmitting sound by vibration, so that the user of each chair can listen to her/his favorite music or her/his telephone conversation, without the sound being heard in a 60 or 70 cm radius, while avoiding that one isolates oneself completely, as it is the case with headphones. This armchair is coated with fabrics that are pleasant to the touch, but above all that allow the use of a bright color, cheerful or with special patterns.